Last Saturday afternoon Stuart and I went to watch the compilation film Britain on Film: LGBT Britain at the Barbican Cinema in London's glitzy Barbican Centre. 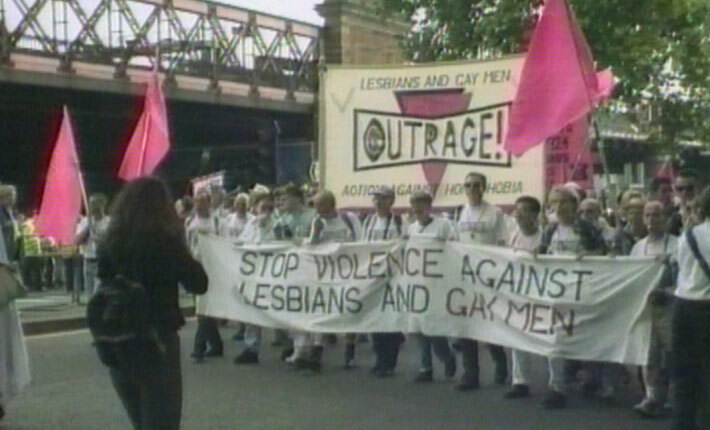 Exploring the rich history of LGBT life in the UK in this special collection of archive films spanned shifting attitudes and the fight for rights from 1909 to 1994. Mainly in black and white, this moving and fascinating collection included some of the earliest known representations of LGBT people on screen, such as a 1925 film on Cutie Cattaro, a boxer more interested in flirting than fighting and a drag queen, "Percy" competing for a beauty prize in 1909. The former looked like a modern skit of machismo in sport and the latter like a Edwardian Benny Hill sketch. Both genuinely laugh out loud funny. The collection of shorts also explored the struggles and identity politics of the ‘80s and ‘90s, the films covered early AIDS victims recounting their painful experiences; the formation of the Gay Black Group, an early instance of intersectional thinking; and the 1980 fight for transgender rights in the European Court. Looking into both the political and the personal, the programme of short films, documentaries and newsreels depicted the collective public fight for basic rights and equality and more intimate and psychological ones: the shedding of shame and the ability to be open about one’s most private self and claiming of the right to love. The most moving part for me was the interview in mid-1960s of the mother. The interviewer was asking the old dear what was her reaction to her daughter coming out to her as lesbian. Expecting a standard respond of "it's disgusting/our daughter means nothing to us now" the lady said, "Well, we were shocked at first. But we felt sorry for her. Not sorry that she was a lesbian. No, no, we were sorry that she must have struggled with the secret before telling us. That must have been so hard for her to keep that secret. It was a very brave thing for her to do and must have taken a lot of courage on her part. It cannot have been easy for her to trust us with that information. She did not know how we were going to react. But we love our daughter and I just hope that as the months go by she feels that her trust in us has been well placed." Not the reaction the interviewer had expected! If you get a chance to see it.. do. It's great.